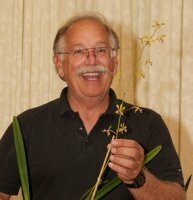 Paul TuskesPalomar Orchid Society is pleased to welcome back Dr. Paul Tuskes. Paul’s presentation will be on “Unique Outdoor Growing Orchids” with an emphasis on growing information for the hobbiest and a focus on the culture of outdoor growing orchids--water, fertilizer, light, and tricks to make them bloom as well as dealing with problem plants. Paul will also discuss how to enliven outdoor spaces by including orchids in the landscaping. San Diego County has a wide range of climates ideal for growing various orchids outdoors. Microclimates can be created within your own yard or outdoor space by providing natural and artificial shade spaces as well as affecting humidity with the incorporation of water features, for example.